Welcome to the world's largest and most comprehensive data base on concrete canoeing. When you enter through our gateway, you'll find links to sponsors, participants, data bases, libraries, photo galleries, video promotions, tips, and feature articles. So whether you're building a concrete canoe just for fun, or aspiring to become a power player at the national level, this site is for you! Created as a portal to student and professional organizations worldwide, this site caters to a diverse audience ranging from the avid canoeist to the most serious national contender. The first concrete canoe competition in South Africa was held on November 22, 1989. Way back then instructions were simple: entrants had to design and construct a two-man canoe to race over a 500 m U-shaped course. The binder used in construction had to be Portland cement on its own or in combinations with extenders. In total, 18 canoes made it to the lake that day but only 16 competed, as two sank before reaching the starting line. This left eight craft in the academic category, and eight in the industry category. After their respective heats and finals, a free-for-all open race was held at the end of the day. Cash prizes were awarded for the top three placements in the academic category while winners in the industry category received trophies. At the end of the day, it was the University of Pretoria team who took top honors by winning both their own category and the open event. Further details on this inaugural competition can be found here. Following the first concrete regatta, it was noted in Construction World that, "Overall, the regatta was a splendid success and I've no doubt it will become a regular - and keenly contested - event in the concrete industry's calendar." Although it has, things have changed sine then. 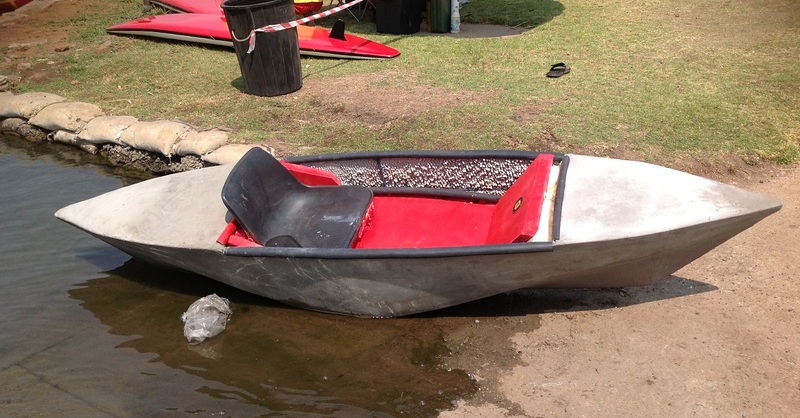 In 2012, for example, students were required to design and construct cement-based boats of the �paddle-ski� kind. This was a departure from the traditional �canoe-like� craft that had been specified in the past, in order to test the students� application of concrete technology and project management. Nowadays, the construction of the boats is carried out according to very strict criteria, the most important of which was that they must float! In 2013, the boats had to be made from a freely available, commonly-used cement, mortar or concrete. Lightweight aggregate could be used. The binding agent had to be predominantly cementitious in composition. Limited quantities of other materials were allowed, provided that they did not replace the binding action of the cement. The strength and stiffness of the boat had to be entirely due to the cementing action between hardened concrete or mortar and its reinforcement. Non-concrete parts were not allowed to contribute to the strength or structural integrity of the boat and could be removed at the judges' discretion. There were more than 100 entries and, as seen here, the competition was covered by Concrete-TV. If your concrete canoe competition is not being covered or this page needs to be updated... please let us know and we'll be glad to do it. The Benoni Sailing Club. Photo by Michelle Fick. The Inland Branch of the Concrete Society of Southern Africa (CSSA) will hold the 26th Anniversary Celebration of their Annual Concrete Boat Race Day on September 12, 2015 at the Benoni Sailing Club on Homestead Lake, Benoni. The new venue greeted hundreds of students, members and their guests at the 2014 Annual Concrete Boat Race Day. It was selected because of its prime location, generous size and its amenities � all of which easily accommodated this growing event in the Inland Branch calendar of activities. The University of Johannesburg fielded "The Kraken." Students from the University of Johannesburg successfully defended their national title at the 25th Anniversary Celebration of the Annual Concrete Boat Race Day. The competition was sponsored by the Inland Branch of the Concrete Society of Southern Africa (CSSA) and was held at the Benoni Sailing Club on Homestead Lake, Benoni. For the majority of events, the boat had to be a two-man paddle ski type craft, based on the student construction rules, which was raced on a relay basis. 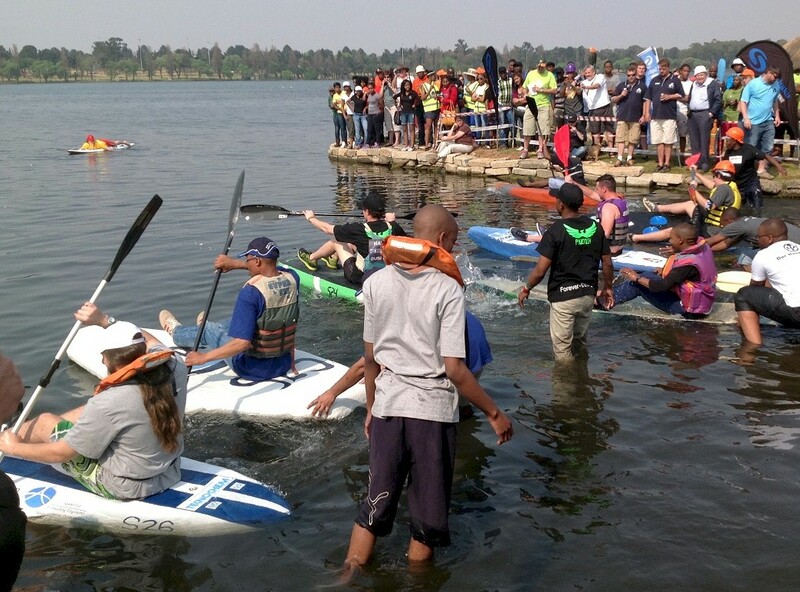 The Inland Branch held their 24th Annual Concrete Boat Race Day at the Victoria Lake Club in Germiston, near Johannesburg on September 29th. The University of Johannesburg's winner in the best product category. There were more than 100 entries in this competition and the event was covered by Concrete-TV. There were more than 100 entries in this competition. The Concrete Society of Southern Africa NPC (CSSA) is registered as a non-profit Public Benefit Organization which promotes excellence and innovation in the use of concrete and related products and services. The Society also provides a forum for networking and technology transfer between its members and local and international affiliates. The right to vote at the Annual General Meetings and Extraordinary Meetings. This includes the right to vote for the election of Board Members and Branch Committees. The right to nominate for election to the branch committee in their province of residence. Free issues of Concrete Beton, The Source Book and Concrete Beton Fulton Awards Edition - hard copies and on-line. Listing in The Source Book. A discount on all fees for seminars and conferences. A discount on the purchase price of printed CSSA publications. Free copies of electronic versions of most of the CSSA�s publications either on CD-ROM or a download from the CSSA website. Discounted rates on publications of our International Partner, namely the American Concrete Institute (ACI). The Concrete Society of Southern Africa NPC realizes the importance of being able to engage with students who are the future lifeblood of the concrete industry. Being able to provide services that are valued by students is at the forefront of the Society�s agenda. Student membership fees are sponsored by AfriSam. The Annual Concrete Society of Southern Africa's Boat Race Competition is organized by Society's Inland Branch. The event is the highlight for the students from the various tertiary education institutions' built environment departments. It brings together members that constitute the Concrete Society and serves to introduce the students to the cement and concrete industry in a fun atmosphere. Additional information about the CSSA can be found here.